NOTE: special thanks to Custard and RangerPL who have done pretty much all the work in updating the mod this time around with Vasily Krysov and I somewhat burnt out. 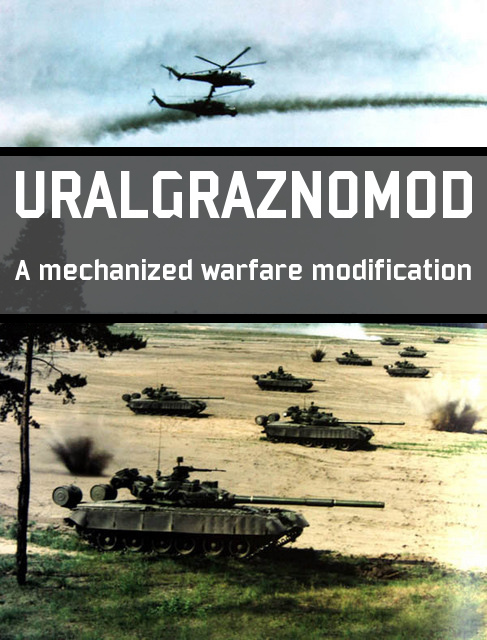 Uralgraznomod is a team project to create an alternative, possibly better, balance to W:RD. It is based heavily on the initial works of Vasily Krysov on tank balance, as posted here and Shan Revan as posted here. Since our first release in late May 2013, Eugen has massively improved the balance of the game, and it is perhaps at its best that it has ever been throughout the series. It is however not without its flaws. Ultimately we offer a different balance experience with slightly different design goals that yields a different experience. IMPORTANT: Please revert to official/vanilla wargame before installing or updating. We're working on a new, more up to date version but this is fairly accurate. There's literally thousands, if not tens of thousands of edits so I wont do a full detailed changelog for each unit but more generally describe the changes. Command units have had their prices massively slashed, availability remains the same. Although still a present and viable tactic, this moves a lot of the action away from command sniping and encourages much more aggressive use of them - ie taking a foothold in a zone and neutralising it for a period. Prices start at about 30pts for infantry and jeeps and extend up to something like 170 for the T-80UK. Supply remains unaffected. This area is really one of the core changes in uralmod and the one I personally have done the most work on. Infantry and transport availabilities and prices have been almost completely redone. Machine guns have been standardised into three archetypes (Static, CQC-Belt and CQC-Box) and RPGs have been completely redone. Infantry anti-tank weapons (RPGs) have been redone from scatch and standardised. MANPADS have all been set to 4HE/180Sup, there have been additional tweaks to various MANPADs. No changes to ATGM weapons themselves at this time, but China now has an infantry HJ-8 team and USA/ANZAC now have infantry I-TOW teams. Generally these changes add up to make line infantry a much more potent force. Shock infantry generally comes with better AT, and still dominates in short range/CQC fights so they must be used aggressively (ie in assaults). Elite infantry are still the best and show it - but have lower cost effectiveness. Oh yeah, USA also got a shock ranger squad and LAV-25s to marine units. Anti-air: this is largely vasily's domain and and probably the most controversial change. Ranges are generally increased, maxing out at 5km for Buks/Patriots/Hawks etc. Some people prefer vanilla, many others have enjoyed this new system and personally I don't mind too much either way. USA now gets an ADATS, also the Roland 3 now comes in a SACLOS variant for both FR and WGER. One must be careful when using planes and having SEAD around is encouraged. Mortars: nothing done here yet, but I want to. Howitzers: Shortly before Eugen rebalanced howitzers, I had done my own job on it based on a lot of math. We decided to revert and try out Eugen's balance for a while but we eventually found it lacking and restored this version. It needs some tweaks (mostly to availability) but so far the consensus has been that different types of artillery are much more viable. Lately I have seen a lot of usage of light guns such as M108s, Abbots and Gvozdikas. Despite lacking the heavy punch of larger pieces, they are responsive and excellent at suppressing. They also kill light units pretty well too. Rocket arty: some price changes, ATACMs removed and replaced with a normal HE M270 and a regular cluster M270. Tanks are the other core of uralmod and mostly the domain of Vasily's work. Changes here are mostly based on sweeping price changes to all units. There have been a handful of re-rolls and stat changes here with a big, and seemingly successful, focus on giving Red Dragons a solid tank force. All tank guns have had -1HE removed from them. Not a whole lot done here. I think a few helo price changes. Recon vehicle re-pricing is in the works but not a high priority. ATGM vehicles have been repriced to better correspond with their abilities. Some low-end, non-radar spaags have been moved to VEH. Not much done here at the moment. Uhh Sokols had iglas replaced with groms. Also not a lot done here, some tweaks to weapons themselves. NK MiG-21's have had their Kh-66s converted into HE missiles. Their MiG-29 has also had a few changes. Please join our steam group for games, news, updates, replays and chats. We encourage everyone with an interest in the mod to join the steam group and to hang out in the steam chat. We are happy to answer questions or just chat. We often organise games here too. CZ - BPzV Snezka - Optics reduced to "Good"
Localization wrote: JPN Patriot Name changed to just "PATRIOT"
USA AGM-114C Hellfire Name changed to "AGM-114L Hellfire"
ANZ F-4E Phantom II Sent to UK, renamed "Phantom FGR.2"
CAN F-18A ASuW Sent to ANZAC air tab as "F/A-18A(F) Hornet"
UK Eurofighter Typhoon Renamed "Typhoon F.1"
UK Tornado F.2 Renamed "Tornado F.3"
UK Tornado F.3 Renamed "Tornado GR.4"
Last edited by ShanRevan on Wed 18 May 2016 19:07, edited 34 times in total. When you put it like that I'm not so sure that is what I want. It's almost as if the pictures are half-joking! Vasily Krysov wrote: It's almost as if the pictures are half-joking! It's precisely because it's 2funny that the T34 train appeals to me. Well then this isn't the mod for you it seems. Vasily Krysov wrote: Well then this isn't the mod for you it seems. It's obvious tanks need an overhaul. I'll probably give this a whirl later today. Although it's not in this release, I am working an infantry overhaul based on the principles of my Infantry megathread. Including a rebalanced MG selection reduced pressure on line infantry and re-working transports a bit. Also the infantry vet damage bonus has been removed (I believe this is in the released version). It is. No other changes to infantry as of yet, just tanks and vehicles that happen to have a gun like tanks. Above it looks like tanks, and below a circus carnival. nah, looks like lot of thought and time went into this, I will definitely give it a spin.